Scotland Women will host world champions USA for the first time as they step up their preparations for next year's World Cup. Shelley Kerr's side take on the four-time Olympic champions at St Mirren on November 17. The match is an opportunity for fans to celebrate the achievement of Kerr's side after last month's 2-1 win over Albania in Shkoder saw Scotland qualify for the Women's World Cup for the first time. Speaking about the fixture, Kerr told Sky Sports News: "This one's been under the radar for a wee while, but we are absolutely delighted. "When the USA, the world champions want to come and play on your home patch you're not going to say no, so it's something we are really excited about." 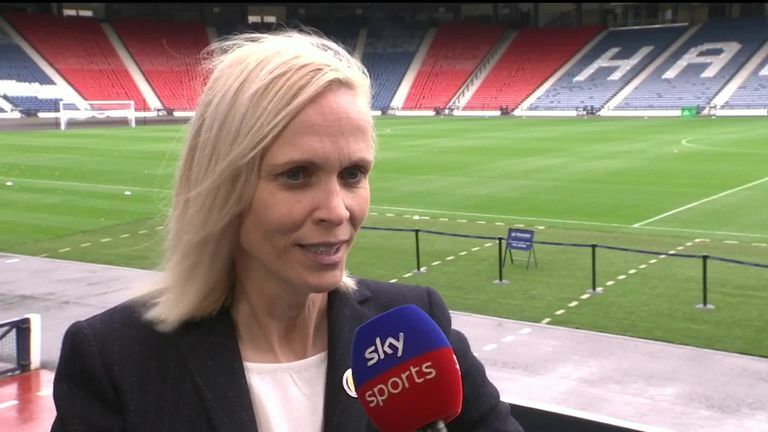 Paisley has been a happy hunting ground in recent times, with a record crowd of more than 4000 fans roaring Scotland Women on to a crucial qualifying win over Switzerland in August. Kerr added: "We want to be able to try and give the support in Scotland something back. "We had a record crowd against Switzerland, I think it was 4098. We're hoping they all come back and bring someone else with them. It's an opportunity they might never get again to see the best players in the world live." The USA are the most successful team in women's World Cup history, having claimed the 1991 and 1999 titles in addition to their triumph in 2015. November's fixture will mark the first meeting of the two sides since February 2013, when goals from Megan Rapinoe, Abby Wambach and Christen Press saw the US take a 3-1 victory in Nashville.